Today has sort of been a real laid back day. Laundry, ya thats always a given. Gave hubby his hair cut. Sorted out our closet so we can give away the clothes we haven't worn in a year. That has always been my rule of thumb going into the New Year. Really if you haven't even worn it in that time frame do you think you will next 12 months? Started to learn to knit today, one of my many challenges for the New Year. Last year I learned how to play chess, which I really love though I must admit we haven't played in awhile. Played crib the other night which I really enjoyed. I love card and board games and as a kid we played lots of them. Monopoly was probably the most played game between us, and some times it went on for days with us hiding our money before the next play. Boy those were simpler times back then. 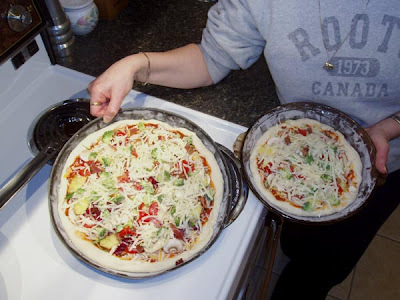 Last night's homemade pizza was delicious and is always a fun way to spend the evening. 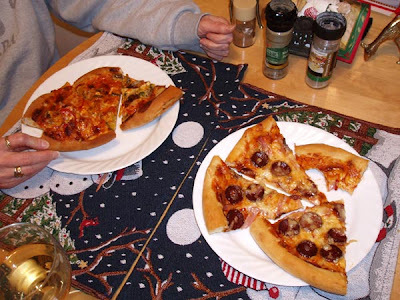 I plan on having friends over soon to make it a snowman pizza night where you roll out the dough in three different sizes to represent the look of a snowman, and then do each circle with different toppings. Yum, I can hardly wait. Tomorrow it is back to work and hopefully I will receive my performance review and maybe a raise. Boy that would set the new year off just right, especially if I get retro pay back to Sept. Keep your fingers crossed for me and I will hold on to my good luck charm (hubby). Past the Middle of the Month Already?? ?